Be prepared for emergencies with this 9" survival bracelet. It unravels to reveal 16 feet of high tension paracord and has a built-in whistle. Assorted colors. Great fun on their own or as a refill for the Splash Party. Includes funnel. Take these to your leader... and then get ready to party! These unique party supplies will light up any event. Balloons are an essential for all your celebrations, but why just have them float around? 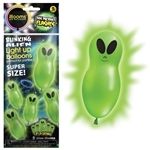 These little green men feature a blinking light in each one for a party decoration sure to make your celebration out of this world, especially after the sun goes down. Fill 'em with up faster with this hose and faucet adapter. 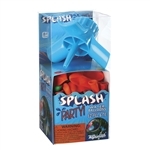 Includes screw on spout, 80 water balloons and instructions. Draw big, beautifal spirals with this oversized kit. Snap the tracks together and roll a stencil along the ridges like a cog. have a friend help you and create spiral art together. Kit includes wheel, nine stencils, and three pieces of chalk. These durable 5-1/4� binoculars feature 6x35 power and include a neck strap. A great way for younger kids to enjoy binoculars without risking Mom's & Dad's fancy binoculars. These walkie-talkies are 4-1/2" (not including antenna) and feature volume control and Morse code. Range reaches up to 250 feet! Antenna is flexible.